2017 marked the 55th Anniversary of The Chieftains beginning. 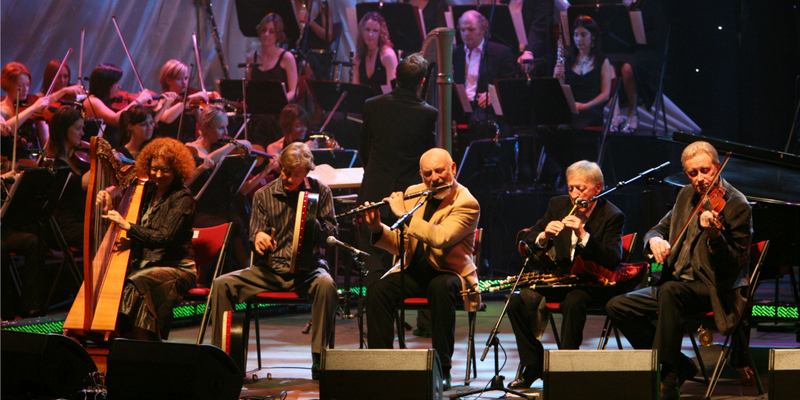 Since 1962, they have been six-time Grammy Award winners and been highly recognized for reinventing traditional Irish music on a contemporary and international scale. Their ability to transcend musical boundaries to blend tradition with modern music has notably hailed them as one of the most renowned and revered musical groups to this day. As cultural ambassadors, their performances have been linked with seminal historic events, such as being the first western musicians to perform on the Great Wall of China, participating in Roger Water’s “The Wall” performance in Berlin in 1990, and being the first ensemble to perform a concert in the Capitol Building in Washington DC. In 2010, their experimental collaborations extended to out of this world, when Paddy Moloney’s whistle and Matt Molloy’s flute traveled with NASA astronaut, Cady Coleman, to the International Space Station. Although their early following was purely a folk audience, the range and variation of their music and accompanying musicians quickly captured a much broader audience. The Chieftains are never afraid to shock purists and push genre boundaries and the trappings of fame have not altered their love of, and loyalty to, their roots. They are as comfortable playing spontaneous Irish sessions as they are headlining a concert at Carnegie Hall. After fifty-five years of making some of the most beautiful music in the world, The Chieftains’ music remains as fresh and relevant as when they first began. Tickets are $125 for premium orchestra pit seating, and $65, $50, $40 or $30, depending on location. A $3 theatre facility fee and sales tax will be added to each ticket. For groups of 10+, contact the box office at 336-333-2605.